In April, I decided to sign up for this program called the 100 Day Challenge. The Challenge started before tax time and before my 2nd semester of teaching was over. “Not exactly the right time since I’m totally frazzled,” I thought. Excuses, excuses…here they came. The second excuse: it costs $200. A third excuse: this is just motivational hype…. and more and more fear, panic and what will people think of me bull hockey. So, I signed up. I thought, what’s the worst that can happen? I lose $200. What’s the best that can happen? I learn some powerful lessons that actually change the course of things. BINGO. SIGN ME UP. I signed up and kept it secret for quite a while afraid of judgments against it. Now that it is over I can happily report that it was an incredible experience – not easy, but incredible. Therefore, I STRONGLY recommend the program to anyone who wants to see some changes in their life – in any area. This is not just for artists or entrepreneurs; it’s for everyone. It’s not just to make money or lose weight; it can be for developing mindfulness or spending more time with your family or any area in which you would like to see dramatic growth. The program is designed to walk you through any goal and keep you motivated while working on it. You are the one that makes it happen though, by taking action and following through. So now I will share what my particular goal and experience was. Disclosure: If you have weird beliefs about making money or are too much of an idealist and think that you should be a starving artist, READ NO FURTHER. My goal happened to be a painting sales goal. I wanted the fulfillment of selling more of my work. I mean, after all, that’s part of why I’m making it right? The program encouraged you to set a big goal, to be clear on what you wanted. I already knew what my ultimate goal was for a yearly salary, but it always seemed so far off in the future, and I always thought, “Hey, what control do I have over whether or not people want to buy my paintings?” and “I have my work in galleries across the country, and I’m doing everything I know how to do otherwise to make an income.” Other thoughts included, “Geez, I hate marketing stuff. I don’t want to be a sleaze-ball salesman. It should be about the art. People will judge me for being superficial and caring about money.” (Insert dramatic eye roll) The truth was that I knew there had to be some other ideas or options and I already knew I was putting off a lot of things that would improve my circumstances. Although I was at the point of burn-out, I felt there was no better time than this when I’m sick of my current results and needing to re-focus. So I set a big goal. Since the challenge was 100 days – roughly three months, my goal was 1/4 of what my eventual hopeful income will be … which just happened to be more painting sales income than I made all of last year! I thought wow, this will be darn near impossible. But I started the program with such excitement anyway, not with doubts, determined to give it everything I had. The daily videos from the 100 Day Challenge kept me focused on how to reach my goal; on days that I was sinking back into comfort zone or wanting to give up, the program kept the flame lit until I could see some more results. Halfway through the 100 days I had made more than 60% of my goal. I was so elated! Then the plateau came and all the doubts that came with it. The next 2 weeks (I know, long time right?) I saw very few results ….and started to think this was all I was going to be able to do. I became tired of trying, so there were a few days that I put out very little effort and felt bummed. I realized I didn’t want to end like that; I would rather not reach the goal, doing everything I could, than not reach it and wonder if I had really given it my best shot. By the end, I am happy to report that I reached 95% of my goal! The goal was not simply about the money; it was about doing what I needed to do instead of blaming others and feeling powerless for what income wasn’t coming in. I took back responsibility and in turn felt more powerful and in control (not in control of the outcome mind you, but of my own actions and mind). Understand WHY you want to achieve them. What will that success look and feel like? Brainstorm ways that you can reach these goals. Just take a piece of paper and start righting down ANY idea that comes to mind…don’t judge it or say that’s a stupid idea. You probably already know lots of things you can do to help reach your goal, but if needed, then do some research. But be careful, as research can often become a form of procrastination. Set quarterly, monthly, daily, weekly, even hourly ways to reach your goal and keep track of which goals you meet. The biggest thing that helped me once I had a list of brainstorm ideas and actions was to plan out my day in 30 MINUTE SEGMENTS. Yep, 30 minutes. This level of attention was a life changer for me. Sometimes, I have so many little things do that I’ll do those all day and have no energy left for the very important stuff. I mean, I’m an artist, not a housekeeper, people. What is going to move you closest to your goal the fastest? Take action on these first! You can’t get around some daily to-do’s… like food…we do need that to survive. Do them last, do them first, I don’t care…just do them fast and only the ones that HAVE to be done. Are there things you can hire out? Automate? Or not do at all? You’re gonna have days that you want to give up and quit. It’s okay. Go back to your Why’s on your goals. Think about how you’re gonna feel having reached them and take a day off! The program actually reminds you constantly of how important self-care is, that you are well rested, well fed, spending time in nature and with loved ones. You actually perform better and new ideas come to you when you do this. But when you rest, rest. Don’t be anxious that you don’t have your nose to the grindstone. 7. DO SCARY AND NEW THINGS. Execute the ideas that scare you the most and the ideas that you’ve never tried. Be open to new ways of reaching your goal. We tend to follow what’s modeled for us. I mean, you only know what you know how to do, right? Wrong. Open up to other ways, look for other options and question previous beliefs. One thing that happened to me was that I started getting requests for commissions just out of nowhere. I’ve rarely done commissions before, and I didn’t care for it when I did, but I was open and said YES. The commissions brought in 30% of my sales goal, I had no conflict with the clients, and I enjoyed doing the paintings. There are people out there who will never need something like this. They’re just cool how they are. I wish I could be that way, but darn it, Jim, I need some help sometimes. I don’t get anything from the 100 Day Challenge for sharing this information with you, but I was so happy with my experience I wanted to share it in hopes that it might help someone else, however needed. The Spring 2019 Online Showcase is from March 1 - May 15, 2019 and will be open to Associate members. Learn More! OPA's 2019 National Jusried Exhibition is being hosted by Illume Gallery of Fine Art, located in Saint George, Utah, from May 10 through June 7, 2019. Learn More! 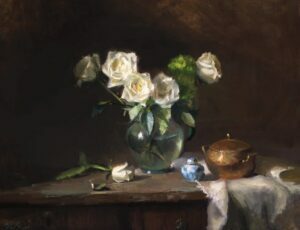 Kelli Folsom is an emerging artist specializing in dramatic light and shadow still life painting. Since graduating from art school with her B.F.A. from Lyme Academy College of Fine Arts in 2011 she has received numerous awards and scholarships for her work. To read author biographies, learn about past bloggers or submit an article for review, visit the OPA Guest Bloggers page.